I’ll admit to being the slightest bit obsessive-compulsive when it comes to a few (just a few) things in life. One of them is the arrangement of books. 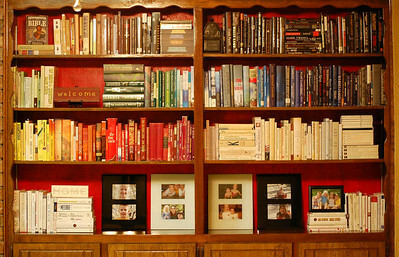 Book lovers — and most writers — tend to have extensive collections of books and obsess over their arrangement. I used to have my books divided into two categories: fiction and nonfiction. They were then alphabetized from left to right on my shelves, with fiction at the top. This is always how I’ve done it, and, yes, it’s a little bit OCD. I changed that this weekend. But instead of freaking me out, it’s been OK, because I replaced that first OCD organizational system with another, equally obsessive system. I arranged my books by color. Yep, color. I was inspired by a few cool photos I’d seen on flickr of books organized that way, and I thought it looked cool. So I did it. And you know what? It looks cool. Anyway, thought I’d share. Here’s a pic of the shelves now. Here’s a larger photo, if you want. So now it’s your turn. How do you organize your books? By author? By color? By coolness?